CHAdeMO is a specification for high power DC charging of EVs, originally developed by a consortium of Japanese manufacturers and power companies. It is most commonly seen on vehicles such as the Nissan Leaf and Mitsubishi Outlander. CHAdeMO charging stations have been installed in many areas, often with the benefit of Government grants or other funding. Since GM and the German marques have backed the competing CCS (Combined Charging System) specification rather than CHAdeMO, public charging facilities often have one connector of each type on a single charging station – typically styled like a fuel pump with multiple ‘hoses’. DC charging means that, like a Tesla Supercharger, the charging equipment connects directly to the battery in the car, bypassing the car’s on-board charger. As the plug is a different shape (and much bigger) than the Tesla charging connector, an adapter is needed to connect a CHAdeMO charger to Tesla vehicles. The name CHAdeMO is a pun: it is a shortened version of the Japanese for “How about a cup of tea?”, while (to a Japanese ear) it sounds like “Charge on the move” in English. Like Superchargers, CHAdeMO was designed to give their target vehicles an 80% charge in about 30 minutes, “the time it takes to get a cup of tea”. However, this refers to small-battery vehicles like the Leaf, so the time to fill a Model S from empty is much longer – on average, about three times as long as a Supercharger. What’s in it for Model S drivers? 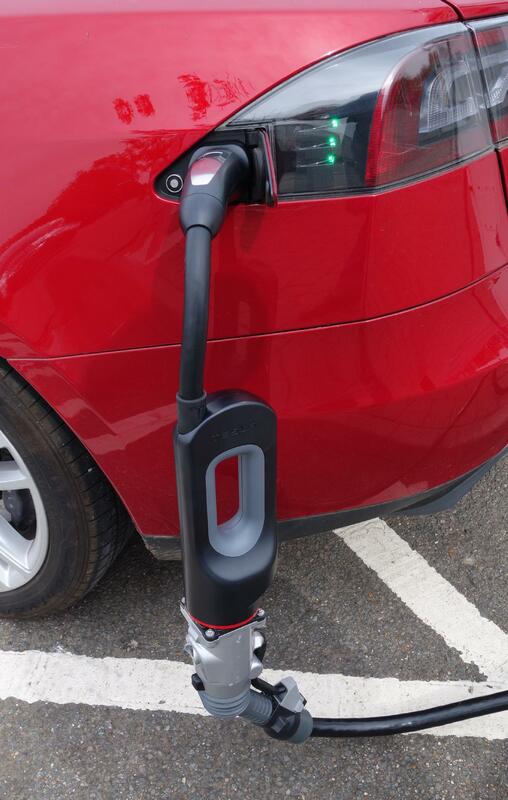 For long-distance travel, nothing beats a Supercharger, so why would you use a CHAdeMO charger? The answer lies in their locations: in many parts of the world there are many more locations with CHAdeMO than Superchargers. Since they are intended for short-range EVs like the Leaf, they are spaced much closer together than Superchargers. For Model S drivers, this means that CHAdeMO charging is particularly relevant for shorter journeys. For very long journeys, you often have a choice of routes and can pick one that goes past a Supercharger, and taking on a lot of charge using CHAdeMO would be too slow. Conversely, for shorter journeys, especially out-and-back day trips that are not much beyond range without charging, a short stop at a CHAdeMO on your natural route can be much more convenient than taking a detour to a Supercharger. Another use is in place of destination charging. Superchargers are generally placed on long distance routes, expecting you to get overnight charging at your destination. But if your hotel doesn’t offer charging, there are increasing numbers of CHAdeMO chargers in urban locations and tourist destinations – not ideal, but much better than being unable to charge at all. In Europe, public charging stations with CHAdeMO often have an additional ‘hose’ with a type2 connector on it (primarily intended for the Renault Zoe). This type2 connector can also be used to charge a Model S without needing the CHAdeMO adapter, but that is very much slower – about 2 hours to take on the typical ‘top-up’ that would take only 30 minutes with CHAdeMO. Fitting the optional second charger to the Model S can reduce that to 1 hour, but at considerable cost. The CHAdeMO adapter is much better value. If there are CHAdeMO chargers in the area of the world where you travel, the Tesla CHAdeMO adapter is likely to be a good investment. The connectors are large and “clunky”. Some of the older designs of CHAdeMO stations are incredibly badly designed from an ease-of-use point of view. Many drivers have struggled to make the equipment work on their first visit (and this applies equally to Nissan drivers). Hopefully the hints later in this article will help you avoid these problems. CHAdeMO stations have a poor reputation for reliability – particularly the ones made by Nissan/DBT (which unfortunately are the most common). This can be a major problem for Nissan drivers, though for the Tesla driver it tends to be more of an inconvenience – if you were only planning on getting half a charge anyhow (as suggested above), you probably have the range to carry on to the next CHAdeMO location or divert to a Supercharger. At some locations, you will see the charging rate reduce significantly after 30 minutes. This is Tesla’s work-around for a design fault in these particular CHAdeMO stations, which overheat if used at full power for too long. Those 30 minutes will have given you about 70 miles of range, so if you need much more than this it may be better to make another stop later in your journey rather than continue at the lower rate. The rate of charge at a Supercharger varies dramatically, and is by far the fastest when the battery is nearly empty. The rate of charge using CHAdeMO is slower overall, but reaches its fastest rate when the battery is about 75% full. Both become very slow beyond 90% full. This means that if you have multiple CHAdeMO to choose from on your journey, it’s better to stop relatively early (the opposite of the advice for Superchargers). Just like Superchargers, it makes no difference to CHAdeMO charging whether you have the optional 2nd charger installed in your car or not. Superchargers are all free-to-use and you simply turn up. Many CHAdeMO locations require payment, and even those that don’t usually require membership cards or an app on your phone to authorise access. Some are privately owned or limit who can use them (notably those at Nissan dealers). Superchargers are all shown on the navigation system in the car. CHAdeMO locations will only appear there (as grey charging location markers) after you have visited them for the first time. You will need to consult other maps, or apps such as Plugshare, to find CHAdeMO locations. Open the chargeport on the car – either from the touchscreen before you get out, or by holding down the tailgate portion of the keyfob. The button on the CHAdeMO adapter will not do this for you, unlike other cables with the Tesla connector on them. 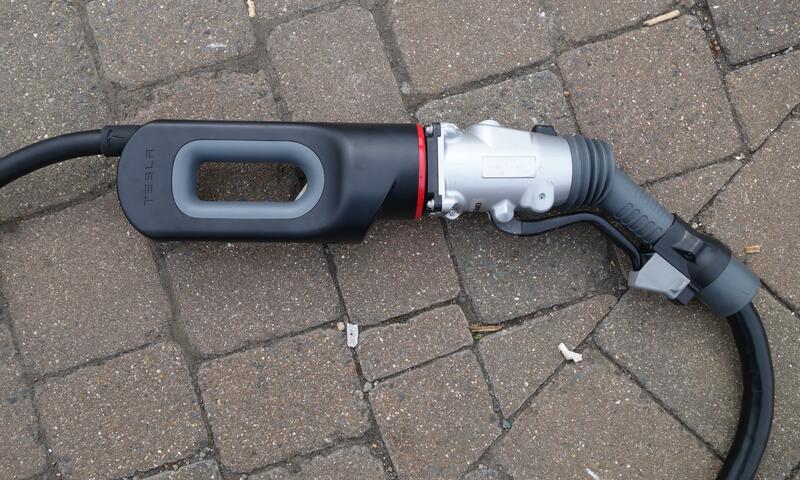 Identify the CHAdeMO ‘hose’ on the chargepoint, if it has multiple outputs. Note that the chargepoint may have an AC connector that will connect direct to your car without the adapter, but you don’t want to use this (except in an emergency), since CHAdeMO charging using the adapter is always faster. Most CHAdeMO chargers only allow one of their connectors to be used at once, so if another driver is already using one of the other cables you will probably have to wait (some models allow their AC connector to be used at the same time as either CHAdeMO or CCS). Shake any rainwater out of the connector. Although most chargepoints have a way of stowing the connector to keep it dry, other drivers often hang them up the wrong way or leave them dangling on the ground. Note which way up the CHAdeMO connector has to plug into the Tesla adapter (see photos below). The socket is almost circular but with two grooves that make it fit only one way up, but it is possible to cram it most of the way in upside down (which obviously won’t work). Insert the CHAdeMO into the adapter, and then plug the free end of the adapter into the car. This is normally easiest done with the adapter in one hand and the CHAdeMO in the other, but if you find the connectors too heavy to handle easily one-handed, you can insert the adapter into the car first and then plug the CHAdeMO into the adapter. Ensure that the connector is locked into the adapter. This may be easy or very non-obvious depending on the type of connector fitted on the particular station you are using. You might be lucky and find one of the ‘easy’ ones on your first CHAdeMO experience, and then get caught out when you encounter one of the tricky ones later, so be sure to look over the section on connectors below. If you get this wrong, there won’t be a clear message saying “connector not locked”. Instead, it will spin for about 30 seconds attempting to communicate with the car and then put up a generic “communication failed” error. Use the controls on the chargepoint to start the charge. This will usually involve selecting CHAdeMO (from a range of other options), presenting your membership card, and pressing a button to confirm that you have connected the cable to the car. See the section on controls below. Wait for the charging to start (about 30 seconds). This should be obvious from the displays both on the chargepoint and in the car. If it doesn’t start, double-check that the connector is correctly inserted and locked, then attempt to start the charge again. Monitor the charge using the displays or the Tesla mobile app. Note that some CHAdeMO chargers are configured to stop automatically once the battery is 80% full (or some other limit) but usually you can start the charge a second time if you wish to continue charging, slowly, closer to 100% full. When you wish to leave, you must terminate the charge using the controls on the chargepoint, which usually requires you to present your membership card again. You must use the same card you used to start the charge, so if you have several in your wallet that are all accepted by this chargepoint, you will have to remember which one you used! Terminating the charge using the car’s controls may work, but you should only do this in an emergency – some models of charger will get ‘stuck’ if the charge isn’t terminated properly and become unavailable to drivers arriving after you have gone. Now remove the adapter from the car and the the CHAdeMO plug from the adapter. This time, the button on the car end connector of the adapter will unlock the chargeport to let you pull it out (the car’s doors however must be unlocked already – they usually will be if you have walk-up unlocking enabled, but possibly not if you approach the car directly to the corner with the chargepoint). Again, the different types of connector have different unlocking mechanisms, usually involving pressing a button. 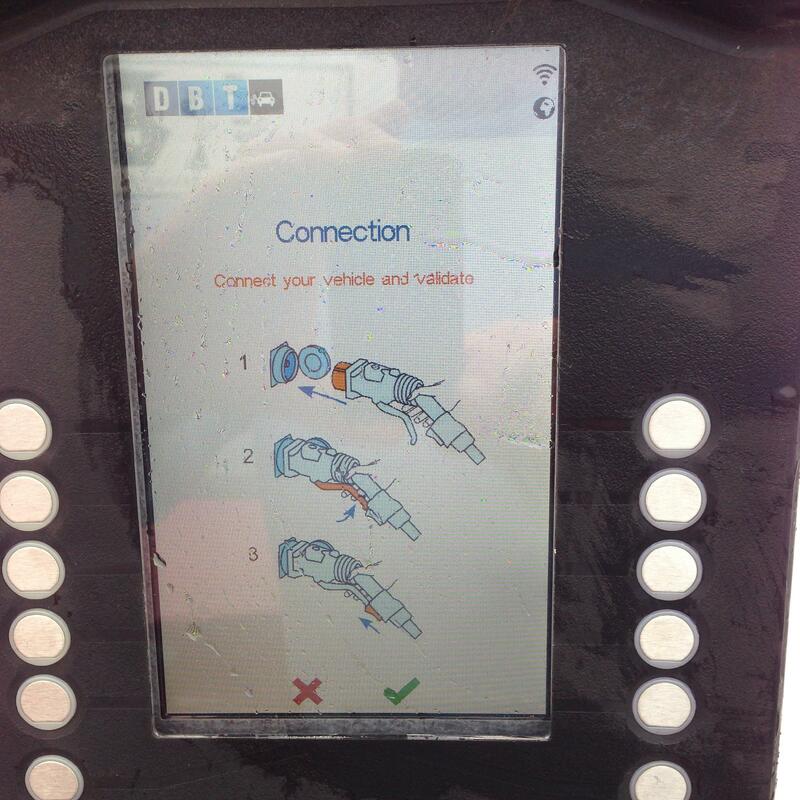 Unfortunately, the error messages you see on the screen of the CHAdeMO charger rarely give much clue as to what is wrong – typically you will see the station trying to communicate with the car for about 30 seconds and then it will fail. The most common cause of problems is failure to lock the connector correctly (see below). There have been reports of incompatibility between the software in certain CHAdeMO stations and the Tesla adapter. Some users report success at these locations if they reverse the order of steps 5 and 7 in the list above: request the charger to start before inserting the connector into the adapter. This is slightly tricky as you only have a few seconds to do it before the charger gives up – probably easiest done by inserting the adapter into the car first, then starting the charge (using your membership card etc. ), then quickly inserting the connector into the adapter and locking it. The Tesla adapter does have upgradeable software inside it – Tesla Service Centres have the necessary tool to apply the upgrade (you can’t do it yourself). At present, there are no known cases specifically requiring an upgrade – indeed some anecdotal evidence is suggesting that older software may work better. If the controls on the station aren’t responding at all, then it is probably faulty – it may be worth calling the helpdesk for the chargepoint owner, as in some cases the unit can be reset remotely. Some designs of unit have an emergency stop button that may have been pressed accidentally (or maliciously). If so, you may consider pulling it out to reset it. A number of different manufacturers make CHAdeMO connectors. Although they are all compatible with the Tesla adapter, they vary significantly in design and in how they work. This is at present the most commonly found connector, and also the most difficult to use. Almost everybody gets it wrong the first time they try! The connector has a release button on the top and a locking lever on the bottom. When you plug it into the Tesla adapter, there is a satisfying ‘click’ and the release button pops up – it seems to be firmly connected but it is not locked yet! You must also pull the locking lever towards the handle and use the rubber boot to hold the lever in the locked position. The photo above shows the connector inserted but not locked; the photo below shows it properly locked and ready to use. After charging, you must first free the lever from the rubber boot (so that it’s back in the position in the 1st picture) and then press the release button on the top of the connector as you pull it away from the Tesla adapter. This new improved connector is slowly replacing the older ones. It is much easier to use – simply push it into the Tesla adapter until the yellow button pops out at the back of the connector and it is automatically locked. After charging push firmly on the yellow button as you pull the connector out of the adapter. While the Yazaki connectors are most common, a number of other types can be found, including one with two buttons (one button to lock, one button to unlock). If you find one not shown here, please take a photo and send it to us! Some of the controls and displays may not be obvious at first glance. Most chargepoints have multiple ‘hoses’ with different connectors on the end, and you need to tell it that you are using the CHAdeMO one. On the DBT chargers, they originally had two hoses which they prominently labelled “AC” and “DC” (with DC being the CHAdeMO). Then they introduced a third hose for CCS (which is also DC! ), so needed a new way of labelling them – they have opted for images showing the shape of the connector. The diagramatic CHAdeMO connector is a circle with 4 small circles within it – the top option in the picture below (compared to the CCS, option 3, with a more irregular shape). One other issue with these DBT chargers can easily catch you out: most of the options are selected by pressing the buttons on the side of the display, alongside the option being selected. However, it also asks you to confirm yes/no selections with a green tick/red cross at the bottom line of the display. 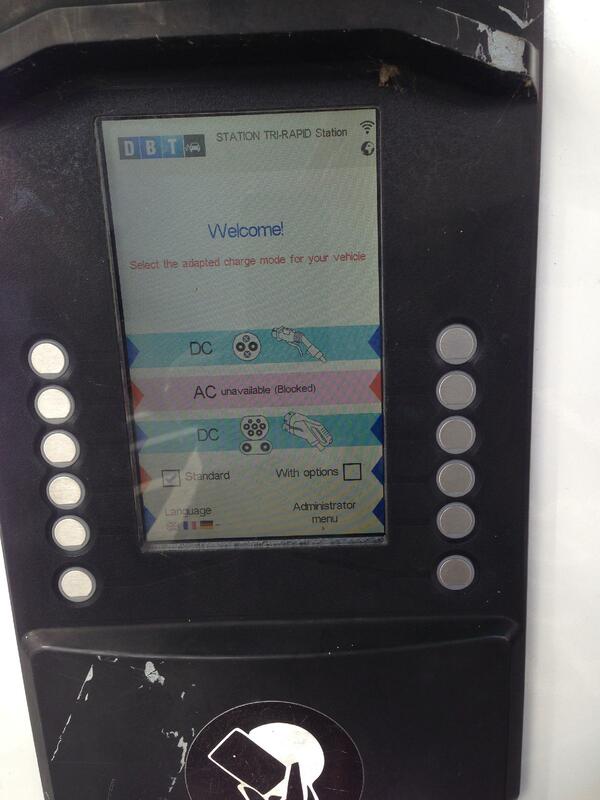 These are not selected using the buttons alongside the tick and cross – instead, there are two extra buttons used for this purpose. In daylight, you can see that there’s a line drawn in the plastic surround that connects the extra two buttons to the place where the tick or cross are shown, but in the dark or if the marking has faded you might not spot this. In the picture, it is the bottom-most right hand button that you need to press, not the one closest to the green tick!